Baby Falls From The Second Floor Window Face First But This Unexpected Miracle Happens! 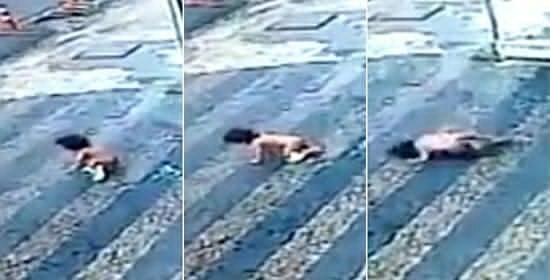 Ceara, Fortaleza in Brazil – this is the heart-stopping moment where a 14-month-old toddler falls from a second floor window – but miraculously gets up with just a few cuts and one bruise. CCTV footage shows the young child falling from a town-center building with such force that she is pushing forward with the impact. In the first seconds of the event, it seems that it is hard to believe the girl – known as Helena Beatrice Nascimento has survived the drop. But seconds later, the toddler, who lands face down on the cobbled stone ground lifts her head, pulls herself up onto her knees and even manages to raise herself into a shaky crouching position on her feet before falling backwards onto her bottom. A taxi driver is the first on the accident to rush to her aid. The man is so astounded that he’s not sure what to do. He was joined by another passerby who picks up and cradles the fallen child. The worried mother appears shortly, rushing out of the building. In a desperate scene she grabs and comforts her baby relieved to find she is alive.